As Malawi's second-largest city, Blantyre represents the country's main commercial and industrial hub and boasts a dynamic array of food options. 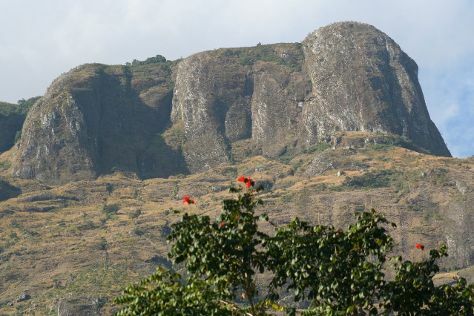 Change things up with these side-trips from Blantyre: Mount Mulanje (in Mulanje), Zomba (Zomba Plateau & Horseback Riding Tours) and Majete Wildlife Reserve (in Chikwawa). Next up on the itinerary: trek along The Way of the Cross/ Njira ya Mtanda, take in the architecture and atmosphere at St.Michael's and All Angels Church, take an exotic tour of a safari tour, and view the masterpieces at La Caverna Art Gallery. To find more things to do, traveler tips, where to stay, and tourist information, read our Blantyre sightseeing planner. Zurich, Switzerland to Blantyre is an approximately 21-hour flight. The time zone difference moving from Central European Time to Central African Time is 1 hour. Prepare for a bit warmer weather when traveling from Zurich in September: high temperatures in Blantyre hover around 35°C and lows are around 22°C. Wrap up your sightseeing on the 6th (Wed) to allow time to travel to Lilongwe. The capital city of Malawi and its largest, Lilongwe serves as an important center of economy and transportation for the area. Step out of Lilongwe with an excursion to Kuti Wildlife Reserve in Salima--about 1h 40 min away. There's much more to do: look for all kinds of wild species at Lilongwe Wildlife Centre, browse the different shops at Old Town Mall, ponder the world of politics at Parliament Building, and take in nature's colorful creations at National Herbarium And Botanic Gardens Of Malawi. To see reviews, maps, photos, and more tourist information, read Lilongwe sightseeing planner. Traveling by combination of flight and car from Blantyre to Lilongwe takes 1.5 hours. Alternatively, you can drive. Traveling from Blantyre in September, things will get slightly colder in Lilongwe: highs are around 32°C and lows about 17°C. Finish your sightseeing early on the 11th (Mon) so you can travel to Likoma Island. Located on the Mozambican side of Lake Malawi, Likoma Island holds plenty of allure with giant baobabs and sweeping views of the wild coast. Kick off your visit on the 12th (Tue): take in the architecture and atmosphere at St. Peter's Cathedral. Here are some ideas for day two: admire the natural beauty at Ulisa Gardens and then see some colorful creatures with a scuba or snorkeling tour. To see maps, traveler tips, ratings, and other tourist information, go to the Likoma Island vacation planner. Getting from Lilongwe to Likoma Island by combination of car and flight takes about 1.5 hours. Finish up your sightseeing early on the 13th (Wed) so you can travel back home.